The judge immediately decided the case favorably because Guru Prasad Swami, Bhakti Bhusana Swami and Manonath — backed by Virabahu, who always hides behind the curtains — through a series of illegal maneuvers and simulated transactions, put the farm IN THEIR OWN NAMES. Through the medium of Yadu’s articles, you will get to know all the facts regarding the present situation at the Costa Rica Farm. The series consists of nine installments, which will be presented successively over the next two weeks. Satyam eva jayate: Only the truth will be victorious! Dear devotees at the Pamho Conference, the Sampradaya Sun, and other Internet forums: Please accept my humble obeisances. All glories to Srila Prabhupada. This time we want to revisit the Costa Rica issue, and give all the Vaisnava readers an update of what happened during this year. I find it appropriate to open up this topic with a letter from Nrisimhananda Prabhu, sent to me last year after I published a document entitled “Guru Prasad Swami’s Testament”. The letter was copied to Guru Prasad Swami and Gunagrahi Swami, and ends with a question, whose answer we will hear tomorrow. Re: your letter… [“Guru Prasad Swami’s Testament”] You’ve done good research, and you should be commended for that. Doesn’t look good for HH Guru Prasad-if it is true that he said that he was leaving everything to Iskcon. But maybe he meant it because he was leaving it to his godbrother and thought that meant “Iskcon” in the sense that Gunagrahi Swami was going to use it for an Iskcon authorized project somewhere. I don’t know what was in his mind. Of course, the fact that the project was in Costa Rica would be justification for the proceeds to go an Iskcon authorized entity in that country for the benefit of the people there, not Argentina or the Turley case. I -we all- would like to hear a response from both of them [Guru Prasad Swami and Gunagrahi Swami]. I can’t understand why a developing farm would be sold, but, nevertheless, my godbrothers should either defend themselves publicly or admit some wrongful acts and lies. I’m not going to judge the situation yet, but, from what I’ve been reading, there is a great need for timely clarification. I beg my godbrothers to explain their side fully without citing on-going litigation as an excuse to remain silent. If there is lying or acting against Srila Prabhupada’s orders, we should all be aware of it, make the appropriate amends, and carry forward with a renewed sense of dignity and purity. I am hardly alone in calling for a rapid, full disclosure of these matters. Right now, based on the information in this letter [“Guru Prasad Swami’s Testament”], it is easy to conclude that the Iskcon authorities have erred, but they haven’t spoken. So godbrothers/sisters like myself want to hear. Maharaja’s?!?! PS: You are free to use my letter in any communications. I’ve thanked Nrisimhananda Prabhu for sending this letter, which I answered privately at the time I receive it. But today I want to thank him publicly for having granting me his permission to use it “in any communications”, and so it happens to be the perfect letter to open up the Costa Rica issue for review. 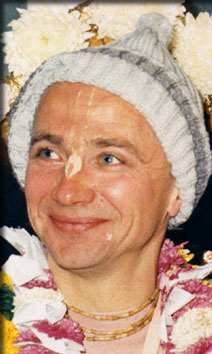 Tomorrow you will receive the answer to the question, or questions, that Nrisimhananda Prabhu has raised. It was published by the supporters of Guru Prasad Swami in their Website, so tomorrow all of you can read it.